When Disney Dream goes into dry-dock this October, she will return with exciting new features. There will be a new Star Wars play area, a Disney Infinity interactive area for kids, a sweet shop for families, and enhancements to the adults-only retreat. This Star Wars-themed development follows the previous announcement of Star Wars-themed days at sea. A newly themed area in Disney’s Oceaneer Club will be open to children aged between three and 12. Kids will be transported to a faraway galaxy at Star Wars: Millennium Falcon, a fun play area inspired by the spacecraft from the legendary saga. Upon entering the spaceship, children will join the Rebel Alliance in the epic battle of good versus evil by assisting with the navigation of this powerful space vehicle. Children can sit in the cockpit and pilot this cool spaceship through hyperspace, triggering light speed jumps to different locations around the galaxy. 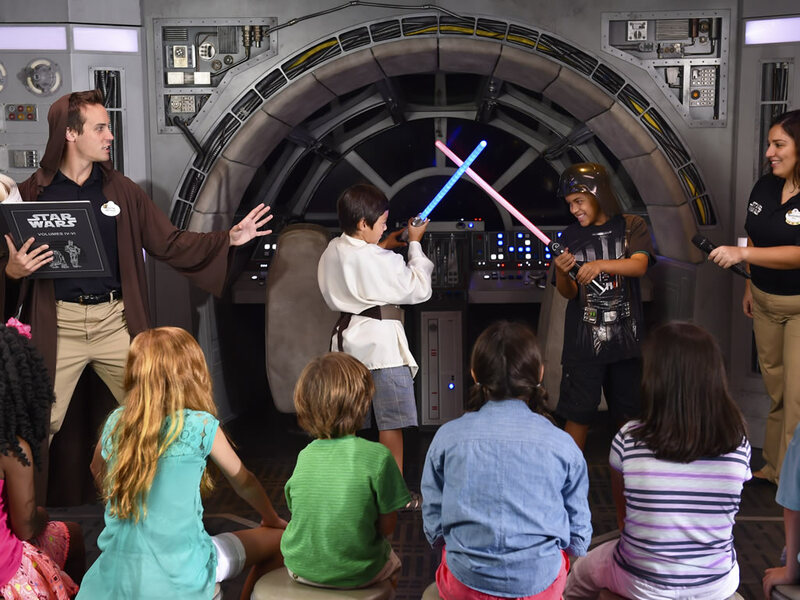 In the Millennium Falcon, children will also be able to express their creativity through Star Wars-themed crafts, games and activities. They will be able to watch episodes from the new Disney XD animated series, Star Wars Rebels, on a large screen or virtually join the rebellion at gaming stations which will feature the series’ action-packed adventures. A high-tech interactive space based on the Disney Infinity video game will compliment the Oceaneer Club. In the Disney Infinity Toy Box area, children will be able to experience a whole new way of playing together with exciting virtual experiences and immersive activities. Customised, on-screen adventures will bring to life characters and stories from right across The Walt Disney Company. The complete set of Disney Infinity character figures will be on display for creative inspiration and available for game-play. Kids visiting this room – only available on Disney Dream – will be able to unlock exclusive Disney Cruise Line content that they can continue to enjoy when playing Disney Infinity at home. Special activities will bring the virtual game-play experience to life in the real world. For example, a life-sized Disney Infinity Base will set the stage where children can take the place of character figures for a group gaming experience like no other. The interactive floor will light up in response to gameplay on the large screen, completely immersed children in the Toy Box experience. Everyone loves a sweet shop. 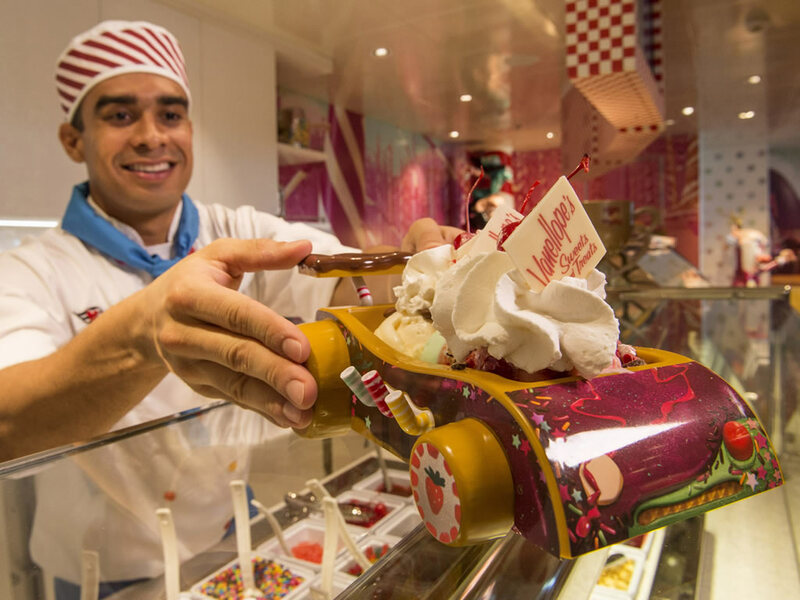 Vanellope's Sweets & Treats will satisfy the sweet tooth of cruisers of all ages, with delicious handmade gelato and ice cream, an assortment of confectionery, and delectable novelty treats for purchase. The shop will sit on Deck 11, and the irresistible smell of freshly baked waffle cones will linger from store’s two entrances - one inside Cabana’s restaurant and one outside on the pool deck. The décor will resemble the whimsical candy land of the Sugar Rush race car game in Wreck-It Ralph. It will feature nods to the film, including a race track and chequerboard-patterned floor, petrol pump styled gumball dispensers, Vanellope’s race car, and King Candy’s throne. This space is somewhere kids of all ages (including the big ones) will enjoy. Bibbidi Bobbidi Boutique on Deck 5 will bring to life the storybook fantasies of young guests with pixie-dusted and piratical makeovers. This exclusive salon will offer aspiring princesses and knights aged between three and 12 the chance to transform into royalty with the help of a fairy godmother-in-training. On pirate party night this boutique becomes The Pirates League where swashbuckling pirates of all ages will have the opportunity to unleash their inner buccaneer. The adults-only space on Deck 13 will benefit from a new water feature called Satellite Falls. A circular splash pool will feature benches and a gently falling rain curtain providing cool comfort from the hot Bahamian sun. Around this tranquil upper deck, adult guests can soak up the sun on comfortable loungers or relax in the shade under a canopy. Disney Dream will go into dry dock for 20 days between 4th and 24th October 2015 in Freeport, Bahamas. Her first sailing with these new enhancements will be a four-night voyage from Port Canaveral to the Bahamas and Disney’s private island, Castaway Cay. This cruise will sail on 26 October 2015. Disney Dream will continue to sail three- and four-night cruises from Port Canaveral to the Bahamas throughout 2015 and into 2016. Which addition are you looking forward to seeing on Disney Dream? Leave a comment below.